A Upstream standby acting as both a receiver and a sender is known as a cascading standby. This behaves correctly - changes on Master reflect in Slave1, and then Salve1 reflect to Slave2. If I disable Master, and promote Slave1 to a Master using a trigger_file then Slave1 is promoted successfully as a Master and I can write to Slave1. However, streaming replication continues between the newly promoted Slave1 and Downstream Slave2. 1. Edit pg_hba.conf to enable replication connections. 2. Edit postgresql.conf to turn on the various replication options. 4. Set up passwordless access to the master from the first replica and second replica. 6. Create a recovery.conf pointing at the master. 7. Edit second slave recovery.conf to point at the first replica. 8. Start the first replica then. 9. Start the second replica. psql -c "CREATE USER rep REPLICATION LOGIN ENCRYPTED PASSWORD 'redhat';"
# to specify a trigger file to recognize a fail over. 2018-03-13 15:48:00.431 IST  LOG:  listening on Unix socket "/var/run/postgresql/.s.PGSQL.5432"
2018-03-13 15:48:00.435 IST  LOG:  listening on Unix socket "/tmp/.s.PGSQL.5432"
2018-03-13 15:48:00.991 IST  HINT:  Future log output will appear in directory "log". 2018-03-13 15:49:01.659 IST  LOG:  listening on Unix socket "/var/run/postgresql/.s.PGSQL.5432"
2018-03-13 15:49:01.743 IST  LOG:  listening on Unix socket "/tmp/.s.PGSQL.5432"
2018-03-13 15:49:01.933 IST  HINT:  Future log output will appear in directory "log". 2018-03-13 15:49:11.149 IST  LOG:  listening on Unix socket "/var/run/postgresql/.s.PGSQL.5432"
2018-03-13 15:49:11.152 IST  LOG:  listening on Unix socket "/tmp/.s.PGSQL.5432"
2018-03-13 15:49:11.179 IST  HINT:  Future log output will appear in directory "log". 017-10-03 16:43:30 BST  @ DETAIL:  End of WAL reached on timeline 1 at 0/190007A8. so slave_2 did not switch over to timeline two after the promotion. 1.create some dummy table check the slave server whther is replicated or not. --check master server whether is recovery mode or not,master will not be recovery mode slave only will be recovery mode. 4.--you can calculate using this linux command how many wal sender is replicated to slave. note:yes! it is successfully replicated the table. --and try to insert the valuse on slave server, slave is a read only mode it will not permitted write transaction. 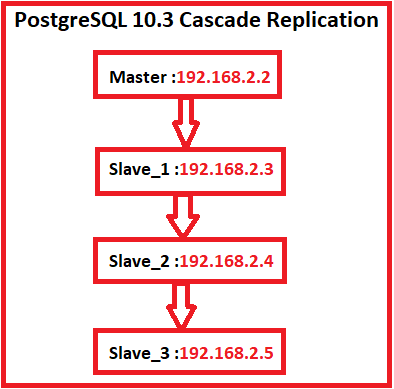 HOW TO SETUP/CONFIGURE THE POSTGRESQL REPLICATION ?